When William began his career in janitorial services, he never thought he’d like the idea of easy to clean epoxy floors. After all, he always did love a good challenge! William enjoyed going up against persistent grease and grime, tough stains, stubborn dirt and debris—you name it. If other people considered it gross and difficult to get rid of, William wanted to tackle it head on. That’s how he chose to roll as a janitor. What would be the fun in cleaning something if it wasn’t hard? So naturally, he decided to work his way up the janitorial ladder. He started out at a mall, and quickly progressed to work in hospitals, hotels, and office buildings—and with each step up, he encountered new types of messes he could battle with the heart of a warrior. Within just a few short years, William had become well accustomed to getting his hands dirty, waging war on some of the toughest, most intense cleaning jobs known to man. And he loved it. So when he was given an offer to work at a local high school, he of course jumped at the opportunity. He imagined he’d encounter a new level of grossness, something that would even surprise him. He was wrong. It turned out that the school had recently replaced their old tile flooring with the easy to clean epoxy floors known as Everlast Floor. Everlast Floor was seamless, unlike anything William had ever seen. It had no cracks, no chips, no pits—there was nothing to dig dirt out of. Nor did it trap odors that needed his attention. Even liquid spills mopped and dried quickly and easily. Much to William’s dismay, this easy to clean flooring didn’t require much work at all! It was enough to drive him mad. 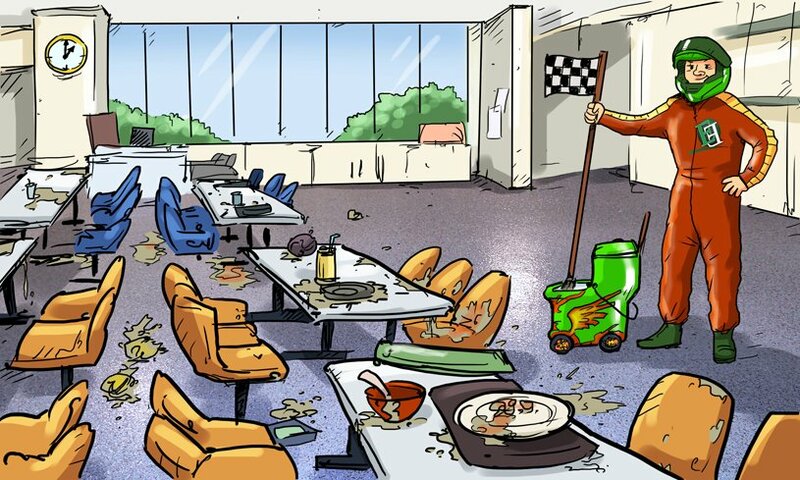 No matter what the students did to the cafeteria floors, they always remained…easy to clean. Most days, his job required nothing more than a little detergent and water. And even the toughest spills were easily dealt with using a cold water degreaser – no scrubbing necessary. He was so bored that he finally started challenging himself to clean faster without sacrificing any thoroughness. Within just a few weeks, William was cleaning all the school’s floors so quickly, the kids began calling him Speedster. This made him think of fast cars, and NASCAR racing. One day, one of the students gave him a gift: decals for his tools. This changed William’s entire approach to his job…instead of being the “tough” janitor, thanks to Everlast easy to clean epoxy floors, he could be the fast janitor instead! Now every day is a race against himself to master his job, and thanks to how easy it is to maintain an Everlast Floor, he never loses. Call Everlast Epoxy at (800) 708-9870 or click here to get your Everlast easy to clean epoxy floors.